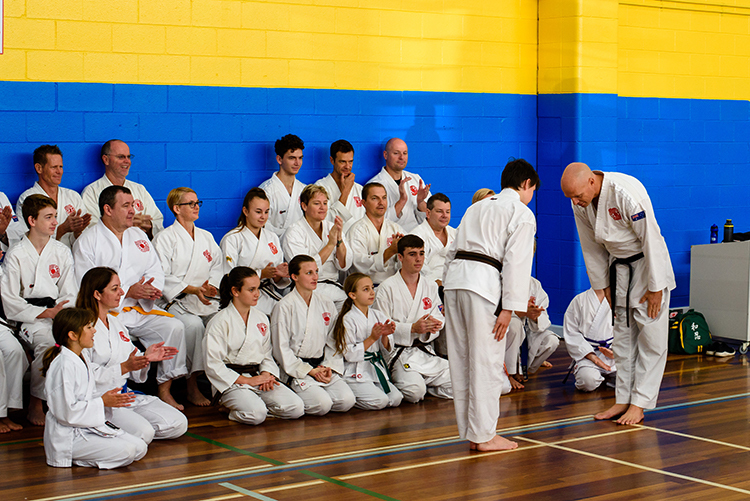 During the 2018 QLD Chito-Ryu Karate Camp Ben Dempsey and Daniel Goldberg challenged for their dan rankings. Both Ben (Shodan) and Daniel (Junior Shodan) presented very well showing the hard work they had put in to be ready for their grading and were successful in achieving their black belts. 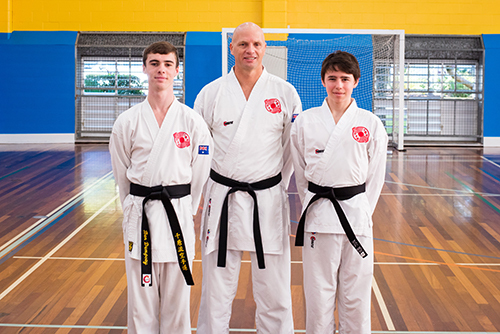 Achieving a black belt in Chito-Ryu Karate is not an easy task and not many people make it to that level, these two are only the 3rd and 4th black belts produced by the Gold Coast dojo in 13 years highlighting the significance of the occasion. A black Belt is definitely earned not given in Chito-Ryu Karate. 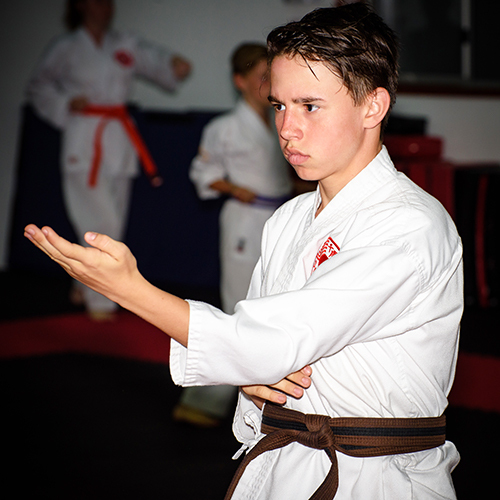 Ben started Chito-Ryu Karate in 2010 as an 8 year old and has continued to train consistently since his first class. In the early days Ben hid in the background a little behind some more dominant personalities but through his consistent hard work, perseverance and great attitude he rose above the other juniors around him. As is always the case in the dojo many of of his peers fell to the wayside and moved on to other pursuits as Ben continued to move through the ranks. 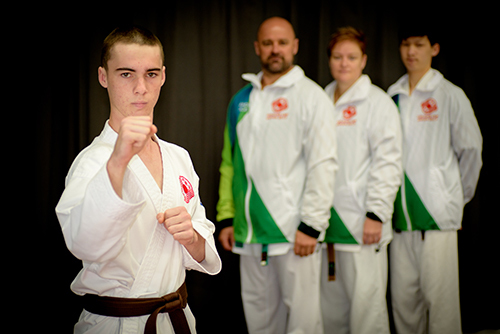 Ben has now been in the senior class for a number of years and has the respect of his fellow karateka through his great training attitude and the person he has become. Through his hard work and challenging himself Ben has become a great tournament competitor, in particular in kumite. 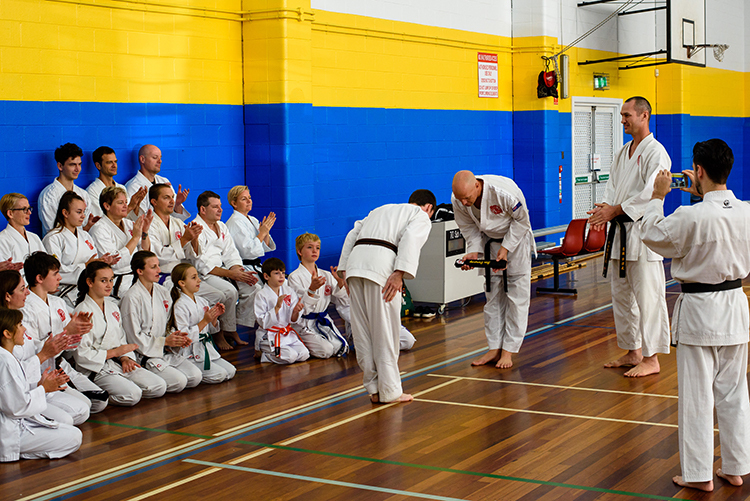 It hasn’t always been easy for Ben in kumite as Sensei Adam would challenge Ben to help him learn just what he was capable of, there were many times in the early days were Ben would be pushed hard to the point of tears but Ben would always push through and keep going. In the last few years that work and the personal strength Ben has developed has seen him step up to the light weight men’s division at an early age to ensure he continually has competition. 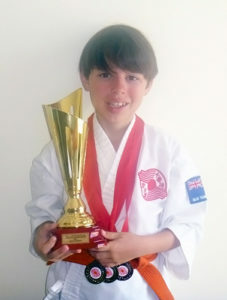 In 2017 he took his tournament skills to the Soke Cup performing well in the individual and as a valuable member of the Gold medal winning Boys team kumite team. 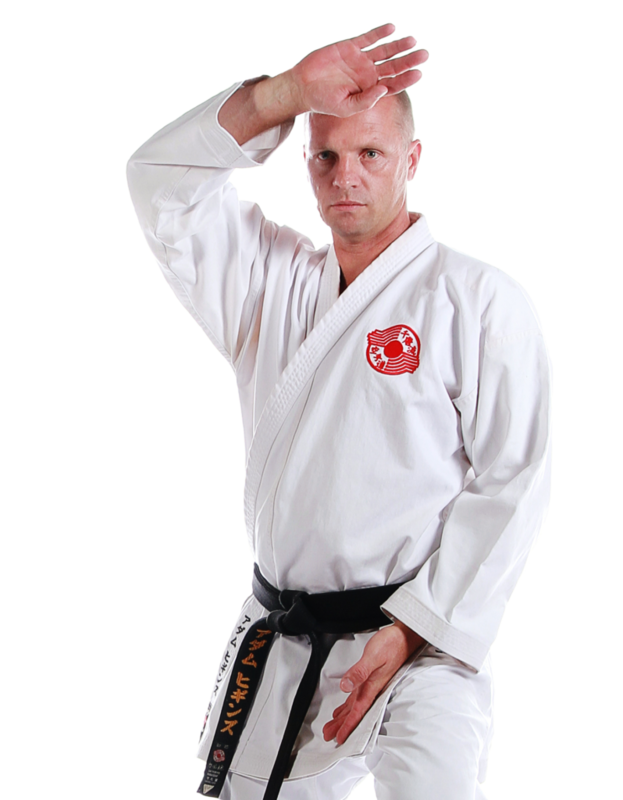 Teaching in classes is not a requirement to achieve Black Belt in Chito-Ryu Karate (being a Black belt does not make you a teacher), but it is another area that Ben has excelled in. He has fantastic relationships with the kids being able to be a fun leader they look up to whilst being able to be firm when required. His ability in teaching is able to be seen in the way he can lead a Little Champion, Junior or Senior class with confidence and is an area that he could be very successful in if he decided to follow a teaching path. Ben has come along way in his karate and has proven he has the technique, attitude and strength of character required to be a black belt. 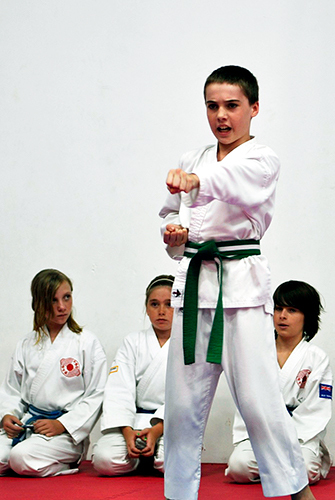 Daniel started his Chito-Ryu karate journey as a 5 year old in 2010. In the early days Daniel was just like the other kids, a little bit cheeky, having some fun and learning a little bit of karate along the way, in fact he didn’t really stand out that much and as such there are not that many photos or videos of him from those early days. Were Daniel excelled was in always turning up and step by step progressing through the ranks until he along with another karate kid (Eugeny) started to emerge at the top of the pack. Eugeny and Daniel would quietly push each other with a determination to be the best and not give in. It was during exercises such as a shiko dachi challenges that you would get to see just how determined these two boys were. In one junior class when the boys were about 8 years old they were involved in a plank vs shiko dachi challenge. After all the other pairs had finished and got a drink the two of them were still going. After 7 and half minutes yamae was called (so we could get on with the class). They were both pretty sore (Eugeny’s legs gave way when he was getting a drink) but neither would have ever given in. Whilst Eugeny moved on from karate Daniel continued and this kind of quiet determination saw Daniel continue to move up through the ranks. Never really standing out but always continuing to work hard and present well when it came to grading time to step up another level. Looking back at Daniel’s journey I think the reason he never stood out was that he always just got on with training with no fuss, it was never about “look at me” with Daniel even though he was very capable. Daniel’s biggest challenge came when he was invited to challenge for his black belt in October 2017 and whilst presented well was not quiet ready with a couple of things to improve on in his technique so was unsuccessful in his grading. For a young boy this could have been very hard to handle but Daniel showed his true grit and determination by turning up to training the next day and once again just got on with it. By the time he challenged for his black belt again he was even better prepared and performed exceptionally well to this time be awarded with his Junior Shodan black belt. Daniel has demonstrated what quiet determination and just getting on with it can do, and sets a great example of how to approach your training. With his great attitude and determination Daniel is on the right path to continue to progress through the dan ranks in Chito-Ryu Karate.